The following eight principles address the three major components of a collaborative modeling process: the Process, the People, and the Model. The principles describe the ideal process to strive for, and are applicable in most situations. Principle 1. Collaborative modeling is appropriate for complex, conflict-laden decision making processes where stakeholders are willing to work together. Principle 2. All stakeholder representatives participate early and often to ensure that all their relevant interests are included. Principle 3. Both the model and the process remain accessible and transparent to all participants. Principle 4. Collaborative modeling builds trust and respect among parties. Principle 5. The model supports the decision process by easily accommodating new information and quickly simulating alternatives. Principle 6. The model addresses questions that are important to decision makers and stakeholders. Principle 7. Parties share interests and clarify the facts before negotiating alternatives. Principle 8. Collaborative modeling requires both modeling and facilitation skills. Collaborative modeling is appropriate for complex, conflict-laden decision making processes where stakeholders are willing to work together. Collaborative modeling can have many advantages and benefits when stakeholders are supportive and willing to participate fully and openly, sponsors are willing to invest time and money to facilitate, and decision makers endorse the process. A team should be cautious to use collaborative modeling when there is little opportunity to share information, resources between participants are unequal, stakeholders’ best alternative to a negotiated agreement (BATNA) is better than working with others, the decision makers do not support the process, or legal or regulatory constraints are significant. Prior to conducting a study, learn as much about the context and situation as possible. If the team judges conditions to be favorable, confirm this conclusion with the community of stakeholders to make sure that they agree with the team and are willing to work together towards a common goal. Conduct a situation (or stakeholder) assessment. Before deciding to proceed with a collaborative modeling approach, learn everything you can about the context of the project. Investigate the history of the conflict and future initiatives that could affect the resource. Engage a collaborative process expert to interview anyone who may be influenced by, has interest in, or could influence the decision or its implementation. Learn about their interests and values, any predetermined positions, relationships, and level of conflict over the issue. Inquire about political pressures facing elected officials and decision makers, and look for any issues entangled in the water issues under discussion. Inquire who else is affected by, can influence, or is interested in the issue. Don’t forget to include those who are indirectly affected (examples include: electrical power customers, people who benefit from reduced shipping costs due to navigation, or people whose lives would suffer if environmental quality declined). 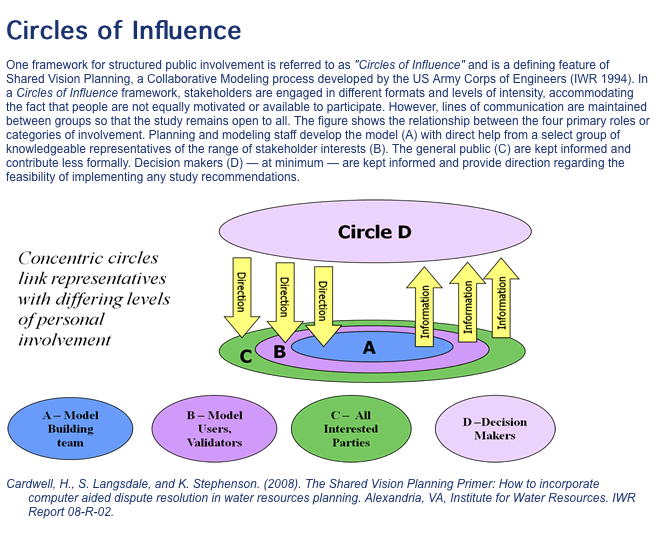 Also, seek to educate interviewees about collaboration and collaborative tools, and their potential advantages when used to address water resource conflicts.1 A situation assessment is often the first step in convening or starting a collaborative process, and is generally performed by a person or team with enough perceived neutrality that stakeholders feel comfortable openly discussing their interests and goals. Determine if all stakeholders are willing and able to participate. Are parties motivated enough (by their dissatisfaction with the status quo) convene a process around the issue? Do they see benefits in using the collaborative modeling approach over the alternative processes? Do they have time and resources to participate? Do the groups they represent allow them to be open to new alternatives, new models, and to share data and resources that are necessary to the process? If any party does not feel comfortable participating, work with them to understand why and see what you can do to resolve their concerns. If their discomfort is irreconcilable, then the team and the participating stakeholders will need to decide if you can achieve success without them. Garner support of decision maker. When the purpose of the project includes implementation of a decision, then you must involve the decision makers to gain their endorsement of the decision and the process. Evaluate your assets and resources. Consider team skills in facilitation and modeling, availability of quantitative and qualitative data, time, and financial resources. Are these resources sufficient to facilitate the process well and to generate a useful model? Consider the other principles when deciding what is needed and if you have the ability to provide what is needed for a successful project. Evaluate progress interactively. Complex decision processes require constant readjustment as they move forward. Set checkpoints where the team will step back and evaluate what is working and what is not, what has stayed the same since the project began and what has changed. Develop a plan for addressing any new challenges. All stakeholder representatives participate early and often to ensure that all their relevant interests are included. Stakeholders are those who are influenced by, have influence over, or are interested in the decision or issue at hand. Gathering representatives of every relevant interest into the room takes some effort, but is a critical factor to the success of the process. Stakeholders contribute to the process from the start by helping to define the scope of the problem, and continue to remain involved throughout to ensure that their interests are represented. Identify who to invite to the collaborative modeling process. A thorough stakeholder assessment will provide you with a foundation for identifying who to invite to participate in the collaborative modeling process. When this list is long (i.e., more than about 30), identify one or two representatives of each primary interest group who are willing to participate actively in the collaborative modeling sessions. They should have the ability to listen with an open mind, work well with others, voice the organization’s concerns productively, and maintain communication with the organization. Keep in mind who will use the model (decision makers, stakeholders, citizens) and its purpose (decision making, shared learning, and/or education). Participants should be balanced by interest, discipline, geography, and government vs. non-government representation. Define the role of the technical participants. Some stakeholders may choose to hire technical experts. (If so, you may need to reconcile power imbalances by securing resources for disadvantaged groups.) Recognize that the solution to a complex water resource issue is rarely purely technical, and establish dialogue regarding the role technical advice will play in decision making. Engage the public. If the decisions to be made will be of interest to or affect the general public, start educating and building public support as soon as possible. Hold public workshops and meetings, write press releases, build a web site, and reach out to the networks of each of the stakeholders participating actively in the process. Public input provides the group with important data regarding what issues are critical for public acceptance of the ultimate solution, and may suggest areas for analysis and discussion that were not suggested by the stakeholders directly involved in the process. Both the model and the process remain accessible and transparent to all participants. Once stakeholders and technical experts are brought together to collaborate, the process and model must be as accessible as possible, and each party must have the resources to participate effectively. The collaborative modeling team must make the modeling process and products clear for them to be fully effective. The best way to achieve this is by involving stakeholders throughout the iterative model building process, through dialogue on what to include, on appropriate assumptions and limitations, on what criteria are important to them for evaluating alternatives, and on the interface design. Avoid technical jargon, acronyms and field-specific language. Stakeholders must be able to communicate effectively with each other to participate in a collaborative planning process successfully and/or to negotiate decisions. Water resources collaborations often include both technical experts and those with little training in water sciences. Avoid or explain technical terms, jargon, and abbreviations so as to communicate more effectively and keep everyone in the discussion. Include the stakeholders in model selection and design decisions (including data, assumptions and limitations), as well as in the testing phase. The best way to create models that are accessible to users is to include users in the model development. With each model iteration participants can help to identify areas for improvement. Provide support to each stakeholder as needed to enable them to participate effectively. Determine what each person needs to know to be an effective representative of their interests, as well as when, where, and how often they can participate. They may need training in the subject matter or in use of computers, access to computer equipment, or conflict coaching. Develop a strategy to interact with elected officials and decision making bodies (state legislatures, state water boards, etc.). Ideally, involve decision-makers in select group activities, but at minimum keep them informed of the group’s progress. Communicate limitations and uncertainties throughout model development. Models that are built in an iterative manner with stakeholders change frequently. Embracing this change as part of the process as well as openly communicating limitations and uncertainties in the model (counter-intuitively) increase stakeholders’ trust in the modeling team. The openness is also vital for ensuring appropriate interpretation and use of the model output. Document the model and the process. Track and officially record model changes, meeting minutes, attendance, and resolutions as they occur. Provide ample internal model documentation including data sources. 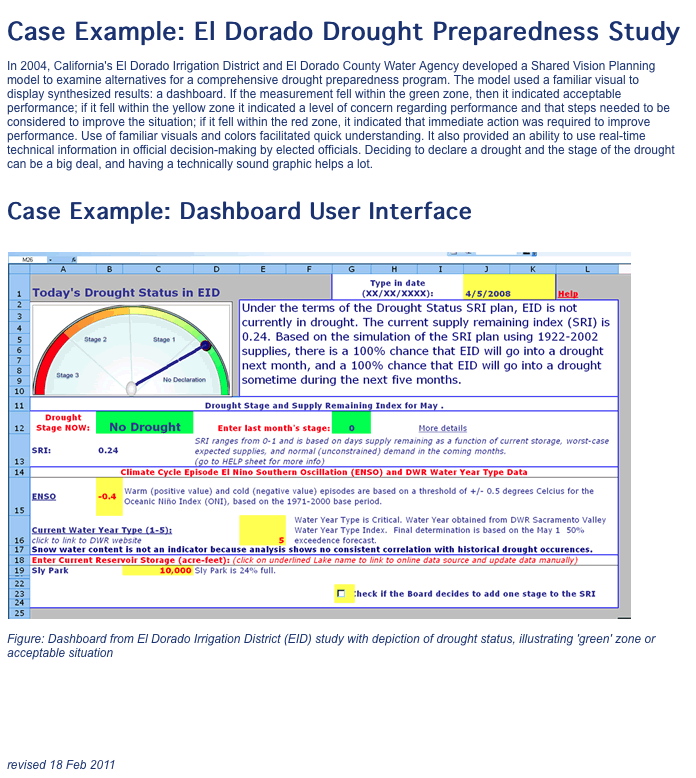 Throughout the iterative model development process, document assumptions, as well as what data/information was selected (or not selected) for use and why. These serve as an important reference for all the participants, newcomers, and the public, during and after the life of the project. See suggestions for model documentation. Create a project web site to post documents and the current version of the model, with instructions and any software needed to run the model. When documenting, consider the life of the process beyond the current project, and leave doors open for future model expansion and use for adaptive management. When possible, budget resources for adaptive management early in the process. Collaborative modeling builds trust and respect among parties. Building trust and respect between and among team members and stakeholders is a prerequisite condition for effective negotiation. Building trusting relationships can also build social capital, expanding the community’s resources for managing future conflicts. Therefore, finding ways to increase trust is important. These can be as simple as sharing a meal together, or can involve using the model to develop a shared vision among the many diverse stakeholders. Design and execute a process where stakeholders are valued for their contributions. Stakeholders are collaborators, not just observers. They assist with process design and in model development. Effective facilitators are neutral and affirm participants who contribute to the dialogue, ensure all members have the opportunity to speak, and manage anyone who may try to dominate. Effective modelers, who are also neutral, incorporate feedback into iterations of the model in ways that are clear and concise, inclusive, and politically acceptable, which can build trust in both the model and the model builders. When there is disagreement as to the technical information, modelers should design features in the model to accommodate all views. Establish a shared goal. Uniting participants under a shared goal is a significant step toward building trust. Establish ground rules for participation. All parties should agree at the very beginning of the process on a set of rules for appropriate group behavior. Creating rules that can be unanimously endorsed by the group helps ensure that everyone is committed to a productive process.Sample list of ground rules. Respect participants’ time. Keep total demands on participants’ time reasonable. Weekly meetings may be too intense, while quarterly meetings may not be sufficient without interim communication. Recognize that volunteers may find it more difficult to devote large amounts of time than those who are participating as part of their jobs. Come to meetings well prepared so that they run smoothly and efficiently. Honor commitments made to the group. Also, keep the timing of the process overall as short as is reasonable, determine when it is time to end the process, and formulate plans for the model and for adaptive management after the process ends. Approach the project with humility. One of the best aspects of collaborative modeling is that no single person is knowledgeable enough to solve the problem on their own, but by learning from each other about the system and their interest, the group can find a solution to move forward. Approaching the problem with humility, rather than leading with an agenda, will also aid in getting parties to be open and trusting. Case Example. El Dorado Drought Preparedness Plan. The model supports the decision process by easily accommodating new information and quickly simulating alternatives. 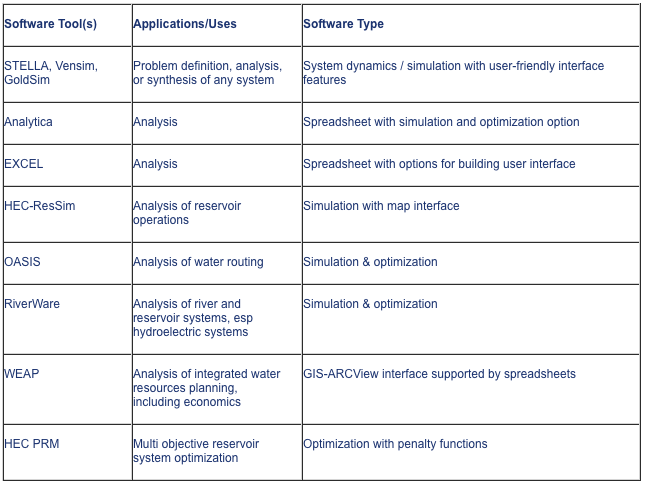 Several reasons to use a computer model to support decisions regarding complex systems include: (1) the model can integrate various sources and types of information easily, (2) the model can accommodate new information easily, and (3) it can quickly simulate alternatives, encouraging users to formulate new alternatives. Integrating multiple sources of information helps to achieve a holistic, integrated analysis, while expanding the range of alternatives increases the chance of finding mutually agreeable solutions. Thus, the model platform (software) and design must support these capabilities, and the collaborative modeler must be proficient enough to be able to accommodate changes relatively quickly. Ensure the model and modeler can accommodate rapid modifications and new alternatives, and can simulate relatively quickly. Ideally, new suggestions can be incorporated during the day of the workshop in which they were suggested. Choice of model software and design play a role. Breaks may provide enough time for skilled modelers to make simple changes, or models can be updated in the evening for two day workshops. Simulations should run in seconds or minutes, so relatively simple, high level models are appropriate for this purpose. Alternatives can be refined later with more detailed models if necessary. Encourage stakeholders to suggest alternatives, and then work with them to translate their ideas into parameters that the model can simulate. This approach provides several benefits. New alternatives increase the chances of finding an agreeable solution; articulating desired alternatives can help to clarify implicit objectives; a stakeholder is more likely to support a process that tried his/her idea; and working with stakeholders may increase their understanding of the model and of how the system works. Encourage representatives of each interest to imagine their ideal alternative, even when it may not be feasible or ignores other interests. Single-interest alternatives most likely will not provide a final solution, but they ensure each interest is included, clarify the impacts of those alternatives on all performance measures, and expand the boundaries of the decision space. Furthermore, discussing these “extreme” alternatives openly diffuses tension between different interests and stimulates creative thinking for more balanced options. Case Example. Lake Ontario — St. Lawrence River Study. The model addresses questions that are important to decision makers and stakeholders. Throughout model development, stakeholders have the important role of identifying what issues are important to them and what objectives they have, related to the issue at hand. If a decision maker will use the model to inform a decision, then he or she must inform the model builders what information he or she needs to make the decision. In complex technical problems, it is easy to get bogged down in model details. It is important to maintain focus on creating a tool that improves the decision making process and facilitates implementing effective, agreed-upon solutions. Frequently ask the team and all participants throughout the process. “Who will use the model?” and “How will it be used?” The purpose for model development should be defined early and revisited often to drive both process and model design. These goals include who should participate, what form the model should take, and what the model should contain. Be sure to revisit these questions after key activities which can shed light onto these answers, such as a mock decision making process (see number 3 below). This helps to ensure that the model stays relevant for stakeholders. Build a simple model early in the process, and then improve it over time with input from stakeholders and experts. The first iteration of the model is a quickly built, simple model which serves to communicate what a model is and what it can do. It supports discussion between the modeler(s) and the stakeholders regarding what the model should include and how its interface should look. It also helps stakeholders see how the model can answer questions already raised, while at the same time generating ideas for new questions. Throughout the iterative model development process stakeholders see their expertise, ideas, values and conceptual suggestions integrated into the model, which helps build trust and transparency.Example of a “mock” model: Chili River Basin. Conduct mock decision making session. Do this at certain stages to help ensure that the model and process support the ultimate decision making objectives. In these sessions, decision makers use the model to inform mock “decisions” that are then issued to stakeholders. The decisions are challenged, not as much for content (there is too little information in the early part of the study to defend a finding) but for scope, criteria and transparency. Are the scope and subject of the mock decisions consistent with what was called for in the study mandate? Are the criteria for the decision making complete and realistic? Does the model provide the information needed to apply those criteria? Does the decision clearly flow from the comparison of alternatives in the collaborative model and the criteria spelled out by the practice decision makers? These sessions help stakeholders refine requirements for the model, to ensure it is providing the information they deem critical for decision-makers. Integrate all the information that is needed to support the decision into the model, but no more. Consider your objectives, data, and resources to determine how broad in scope the model needs to be. Keep the model only as complex as needed. Generally, simpler is better. If a metric does not influence the output, remove it. Parties share interests and clarify the facts before negotiating alternatives. A basic principle of interest-based negotiation is to get parties to focus first on their interests, rather than on their preferred alternatives. The collaborative modeling processes naturally supports interest-based negotiation because the parties work together to build the model first before it can be used for testing alternatives. The model also serves as a common focus, reducing focus on conflicts between parties. Complex problems may have no optimal solution, but through technically-supported dialogue, stakeholders can find ways to manage their resources. Encourage the parties to use the model and the model building process to help them expand and test the set of potential alternatives in order to increase the chances of finding a mutually agreeable solution. A model that is developed with stakeholders provides a common focus for dialogue, supports shared learning, and allows creative expansion of the range of alternatives. Engage stakeholders in iterative model development and technical analysis to foster shared learning. The process of developing a model reveals and tests assumptions, and requires modifying those assumptions when they are shown to be incorrect or infeasible. Sometimes conflict is based on false assumptions or information. Reconciling this cognitive conflict through shared learning reduces this aspect of the disagreement and focuses attention on the interest and values-based aspects of the conflict. Consider establishing working groups on specific topics if the material warrants focused attention and divided labor, and have working groups report back to all participants on a regular basis. Use the interest and values conflicts to creatively expand the range of alternatives. Stakeholders may not be well-educated about others’ interests, so dedicate time for each group to present their interests, values and goals to the other groups, allowing plenty of time for discussion. Ask other stakeholders to suspend judgment and seek to understand, knowing that they will have equal opportunity to talk about their own interests. Intense conflict often means “non-traditional” water interests seek to become involved in finding resolution to protracted disputes. These non-traditional interests can play an important role in creating more room for creative decisions by bringing fresh perspective to the table. The phrase “expanding the pie” is often used when stakeholders broadly define their interests and values, (instead of their positions), which allows them to creatively satisfy their interests. Collaborative modeling requires both modeling and facilitation skills. By nature, collaborative modeling requires a unique set of skills – combining technical modeling skills with facilitation and mediation skills. In smaller projects, a single person with skills in both areas may be able to lead both the model construction and the process. However, for most projects a team of several people provides the combination of skills required. Selection of team members should ensure that the team as a whole comprises all of the necessary facilitation and modeling skills needed. Choose modelers with collaborative skills and diverse modeling abilities, and choose facilitators with the ability to understand and appreciate what modeling can provide. Each member of the team should contribute appropriately based on their skills. Therefore, in selecting a collaborative modeling team, especially the leads, look for people who have skills in both areas or who are capable of learning some portion of the skills they lack or gaining an appreciation for those skills. For example, modelers should be aware of facilitation techniques and be able to communicate effectively with participants. Facilitators should be familiar with the language of model building. They should also understand the basics of the associated science well enough to facilitate technical discussions. Together, modelers and facilitators act as translators of both scientific and social information in such a way as to create a shared language within the collaborative group. This shared language is vital to communication throughout the process and is especially important with respect to model assumptions. Be creative in searching for team members – consider non-profit groups, government agencies, and universities. Ensure you have staff with the required skills throughout the process. At every stage, the team should determine what roles are needed and their associated skills, then identify (existing or new) team members to fill these roles. Make sure any role critical to the success of the project is identified and addressed. Provide opportunities for the participants to give their input on selecting the team members, particularly when there is considerable conflict and mistrust. 1Information collected by survey or interviews may also serve as a baseline to measure interim progress and evaluate outcomes. Michaud and Langsdale (2009) developed a survey specifically to evaluate collaborative modeling.